ore sinned against – William of Struan, executed 1516. Not all historical sources are equal. Many are written or preserved by history’s winners who suppress or destroy those that fail to put the desired spin on events. The shining story of King Robert Bruce is one obvious example. He is the great hero of the struggle for Scottish independence and the rival Comyn dynasty is considered sunk into villainous obscurity. But the Red Comyn had a better claim to the throne than Bruce and a better record in fighting against Edward I. And for the good of Scotland he agreed to form an alliance with Bruce which the latter broke in an act of breathtaking treachery when he killed his rival in front of the altar at Dumfries Abbey. Perhaps something similar was going on in the early sixteenth century with the history of Clan Donnachaidh. The ostensible villain in this case was the chief, William of Struan. The records are murky, identities confused, and clan historians have been working to restore William’s reputation for centuries - and often getting it wrong. But in Atholl we have a priceless historical source. Within the Book of the Dean of Lismore, the oldest collection of Gaelic poetry extant, is the Chronicle of Fortingall. Kept by the Macgregor vicars of Fortingall, its first entry is ‘1390, April 19th Death of John, son of Gregor of Glenorquay.’ It ends in April 1579 with the death of John, 5th Earl of Atholl. It was his granddaughter who married the Earl of Tullibardine and carried the title of Earl of Atholl into the Murray family. Its value lies in the entries being written down at the time they happened by a native of the area and this makes them accurate; none of it has been shown to be incorrect. Sometimes the record is a bare fact; sometimes it comments on the events and characters. When Robert Robertson of Struan died in 1566, the Chronicle states that ‘He was good to those under him, did nothing unjustly, wronged no one, he was a blessing to all his own, and was held in great esteem among his neighbours.’ But the death of a fellow Macgregor a year earlier elicited the comment ‘He was a most wicked man, and an oppressor of the poor; whence it is said – “Thou shalt wilt not suffer evildoers to live upon the earth”. 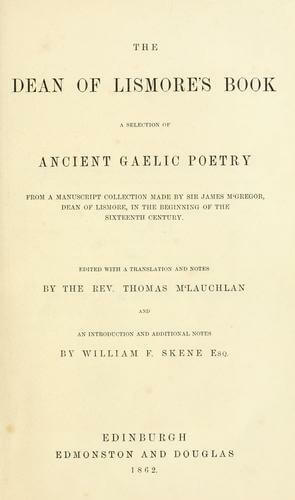 Noel Paton, author of the ‘Descendants of Conan of Glenerochie’, published in 1873 and a mine of clan information, although some of it has been superseded by more recent research, says that William of Struan died in 1532. Paton further records that the chief’s cousin, William, was beheaded at Tulliemet along with John Crichton of Strathurd in 1516 for the murder of Cunnison of Edradour at the order of the Regent Duke of Albany. But that cannot be correct. Crichton was still alive in 1535. The Chronicle of Fortingall records, in 1509, that ‘John Cunnison of Edradour by Moulin was slain by William Robertson of Strowan’ and for 1516 it says ‘Death of William Strowane Robertsone who was beheaded at Tulymat on the 7th day of April’. And this is surely definitive. The Vicar of Fortingall would not confuse the chief of Clan Donnachaidh with his cousin. But why was he executed? Just because he killed Cunnison does not make him a villain. Justice was very rough and very ready at this period and Cunnison may well have deserved his end. Or it may have been a fair fight. The Chronicle does not pass judgement upon William, as it did on MacGregor’s death in 1565. Perhaps it is worth looking at Struan’s circumstances and trying to tease out reasons for his fate. Sir John Stewart of Balvenie was the son of Joan Beaufort, the widow of James I. His father was Sir James Stewart, the Black Knight of Lorn. Sir John was created Earl of Atholl around 1457. He had the castle of Blair, but most of the surrounding lands were held by the Robertsons of Struan, and this did not suit him. William’s predecessor as chief was Alexander who died in 1505. He was William’s grandfather and son of Grizzled Robert who captured the assassins of James I. Alexander married twice, first to a daughter of Patrick, Lord Glamis, by whom he had a five sons and a daughter. His second marriage was to Elizabeth, daughter of John, Earl of Atholl, by whom he had two more sons and a daughter. Robert, his eldest surviving son, married a second daughter of the Earl of Atholl, Isabel, which made his step mother his sister-in-law. Robert died before his father, leaving William as the heir to the chief. Less than two months before his death, Alexander conveyed a huge chunk of his estate to his sixth son, his eldest by Elizabeth of Atholl. This was by a Crown charter which meant that the property passed from the control of the Struan family for ever. These lands consisted of ‘Faskally, Dysart, Calvine, Pitagowan, Kindrochit, Pituldonich and Calziebruar’ from which further cadet families in Lettoch, Dunavourd, Tennandrie, Ledgrein and Balliegullane, Balnacraig, Cultalony etc had emerged by the early 1600s, all of which had the Faskally family as their superiors rather than Struan. This son, Alexander like his father, was a minor; these lands had a liferent on them for his mother, the earl’s daughter. Almost certainly Alexander was the ward of his grandfather, the Earl of Atholl, and thus the latter had control of this great swath of what had been part of the barony of Struan. The earl was also William’s grandfather and very likely his guardian as well since William was a royal ward. On May 31st 1507, the Atholl Chronicles states that ‘A letter of bailery was granted to John, Master of Atholl, [the earl’s son and heir] making him bailie of all and sundry the rents, and possessions, with their pertinents, pertaining to the late Alexander Robertson of Struan (died 1505), and now to the King, through reason of ward, &c.' The Master was William’s uncle and, since his father the earl was well into his sixties, was likely running his affairs. This gave the Atholl family control of all the Clan Donnachaidh lands with William’s step grandmother, Elizabeth, having the liferent of the Faskally lands, and the Master of Atholl, soon to inherit the earldom, ruling the rest of the barony. In 1508 Isabel was granted Letters of Exemption under the Privy Seal of James IV. allowing the tenants of her lands of Struan to remain at home from all service, confirming that these lands were outwith the chief’s control. 1506 may have been the year in which William attained his majority since this is when he gets a tack on his father’s lands. A tack only gave him restricted ownership. A charter would not be granted until arrangements were made to settle any debts for which the lands were security, and these debts were likely incurred by Alexander of Struan. William’s creditor was his other grandfather, the Earl of Atholl, and without control of the estate the young chief would not receive the rents that would have enabled him to pay off the debt. William had lost the eastern part of the estate to his cousin Alexander of Faskally; now he had lost the central portion to his uncle. The 1545 Charter to William’s son shows what was left, the whiskery western remnants - Finnart, Murelaggan, Kinloch, Boyoquhen, Auchinroy, Kinaldy, Cultoloskin, and Killironzie. They run along the south side of Glen Errochty, into Rannoch, Dunalastair and the south shore of the loch. By the summer of 1515, the Clan Donnachaidh chief had lost the great bulk of the original Struan estate. Stories written down in the 19th century were not kind to William. It is said that he led an army of his own followers and Rannoch MacGregors which gave him ‘a band of upwards of 800 warlike and unscrupulous freebooters’ which held together for three years before William was caught and executed. But what choices did he have? The Battle of Flodden in 1513 cost the lives of the King and most of the ruling class and reduced the country to little better than anarchy. William had been deprived of his inheritance and there can have been little else he could do save to wage war upon his oppressor. And he lost the war. The Earl was judge and executioner in Atholl – and he controlled the jury. Even without a charter William would have retained the loyalty of the clansfolk on the old Clan Donnachaidh lands and, by removing his head, his uncle also removed any threat from his clansmen to dominance of the cream of the Struan estate. For William’s successor was Robert, another minor, and thus in no position to campaign for his lost inheritance. He was confirmed in the rump of the Struan lands in 1539. But it seems there was an understandable froideur between Struan and Faskally for more than a century afterwards. There are very few of the normal exchanges and transactions that one might expect in two such closely related and powerful families. In 1645, when Montrose raised Atholl, the Faskally contingent put itself under the leadership of Fleming of Moness rather than the Tutor of Struan. Again in the ’15, Faskally was with the Atholl Brigade rather than Struan’s men. And in the ’45 George Robertson of Faskally was a Lieutenant Colonel in the 3rd battalion of the Atholl Brigade and not part of Struan’s men, commanded by Woodsheal. A final footnote came in 1725 when King James VII created two baronets in Atholl and Rannoch. One was the Poet Chief, but one wonders whether he would have been pleased that the other was Alexander Robertson of Faskally.